My creative groove has been hiding in a deep dark crevice for awhile now. I have been in Austin, Texas for almost 2 years now and am finally exploring the AMAZING options inn this city. 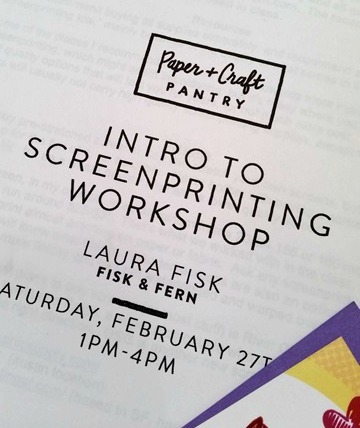 Recently I cam across a small business called The Paper + Craft Pantry and was super excited to see their line up of DIY workshops. 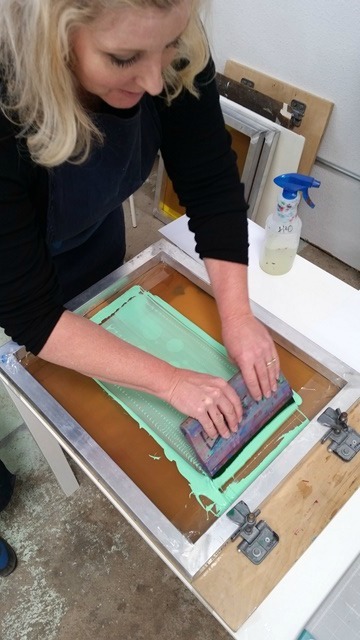 I have tried screen printing before and really loved it, but was a wee-teeny-tiny bit intimidated by some of the process...so when I saw there was a Screen Printing workshop...I signed up! 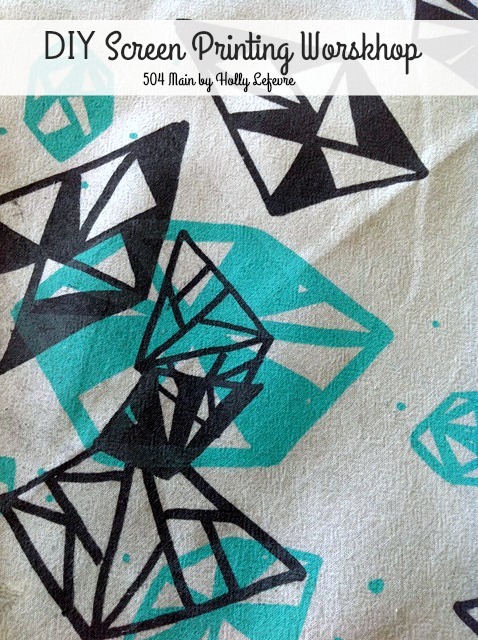 So am I going to teach you how to DIY Screen print in this post...NOPE! I will give you some tips about how I did it at home. Really, I just want to show you this amazing workshop, encourage you to try a new skill (any skill), and to be creative, work with your hands, and enjoy yourself! Since we moved to Texas, I have maybe went out 5 times without the kiddos or hubby. This was a real treat for me, and I plan to do it more often (my hubby is encouraging me too!). During and after the workshop, I felt inspired to be creative, to dive into new projects, and to see what happens...and of course to try more screen printing. Our instructor was Laura of Fisk and Fern. She has the CUTEST line of paper and household goods. 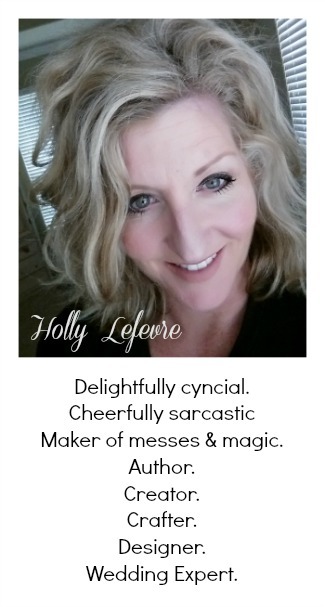 You will love her quirky characters and designs...go check it out! 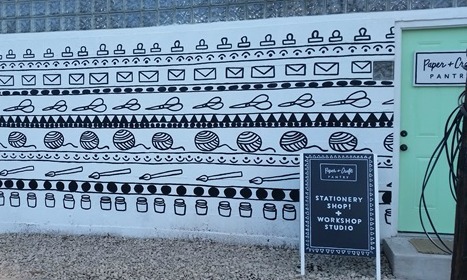 As I mentioned the workshop was held at The Paper + Craft Pantry which is also amazing and full or unique local goods and paper goodies! And she served us Sangria and macaroons! Laura introduced us to basic screen printing supplies and basics and also gave us local resources for materials and supplies. Of course you can buy them online, but I like to shop local when I can. In a nutshell, we learned about screens - the best kind, how to create a screen, how to line it all up, the process, and finally....how to print! The FUN part! We played with ink in gorgeous colors. 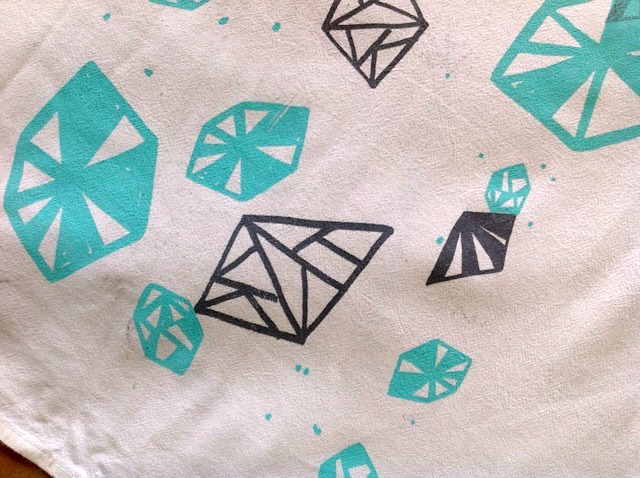 We also made adorable tea towels...with a fun gem design. Sorry no photos - we worked in pairs and we were all full of ink! 1 - If you are looking to take craft classes, check with your local craft stores (even national chains offer classes) or look and see if there are artist coops or independent stores (like Paper + Craft Pantry) and join the fun. I paid $100 for this class, but to me it was worth it! 2 - I could see this hobby - new craft - getting out of control. I have so many ideas for it! 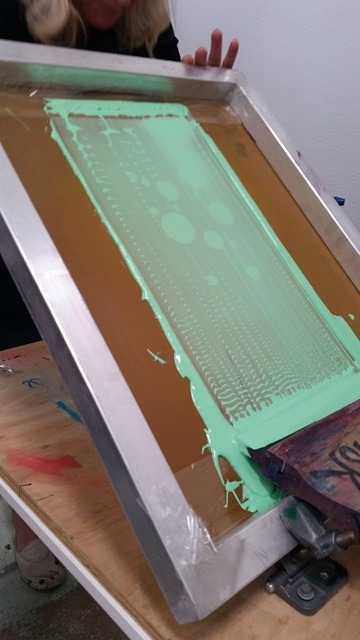 But for just a second, let's chat about screen printing. The initial cost could be intimidating. When I first tried silk screening, I purchased a Speedball Kit at Aaron Brothers...and I used a COUPON! 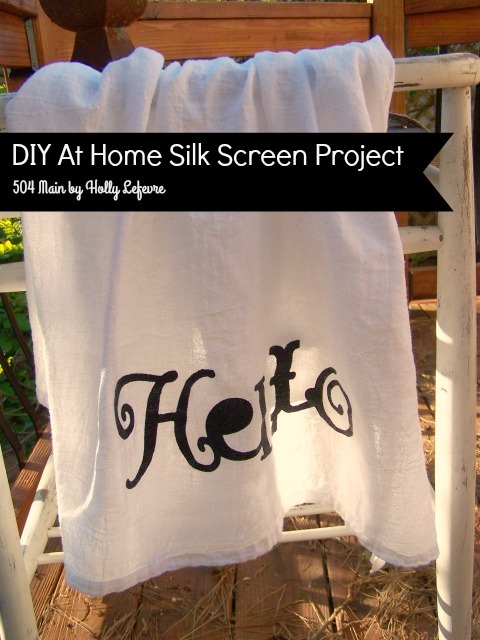 I think for a beginner and still learning silk screener, this is a decent investment - you get a screen, ink, squeege. 3 - If you like the look of silk screen but not sure you want to go all out, Silhouette School has this cool tutorial for faking that silkscreen look. 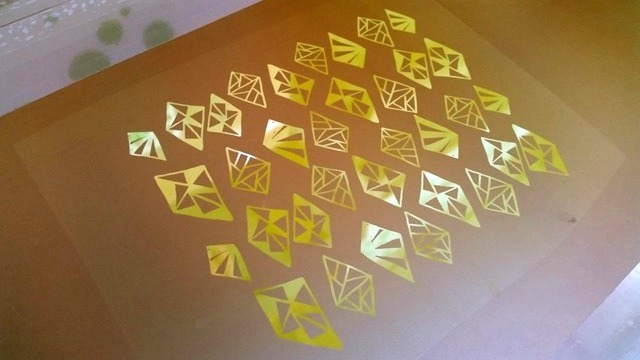 She uses a Silhouette to cut the stencil, but you could use a store bought stencil. 4 - Try a Pinterest search for Silk Screen for some other ideas. Holly, I also purchased a Speedball kit years ago, also, but I think I remember I had to purchase the screen separately. I have dabbled in it, off and on, over the years and still have lots of ink. I have made screens using the embroidery hoops and that worked pretty well. I have done some designs with my Cricut cutter but I hope to get a Silhouette before too many moons. From what I can tell, the possibilites are pretty endless with the Silhouette. 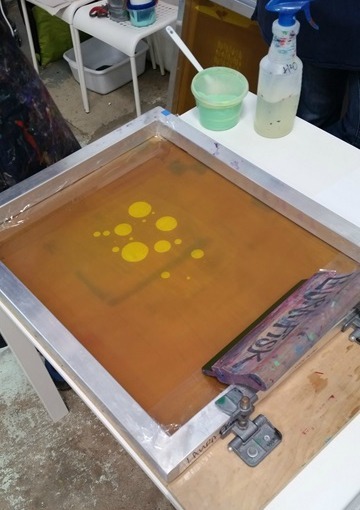 I agree, screenprinting is a lot of fun. I've probably spent way more than $100 on the hobby because I kept adding to my supplies and such. Considering the ink goes a long way and you had the class and an instructor, it was probably pretty reasonable. I still have all my equipment and most of the inks and, as I said, have used it all for years. I will be excited to see the things you make! This is so cute. 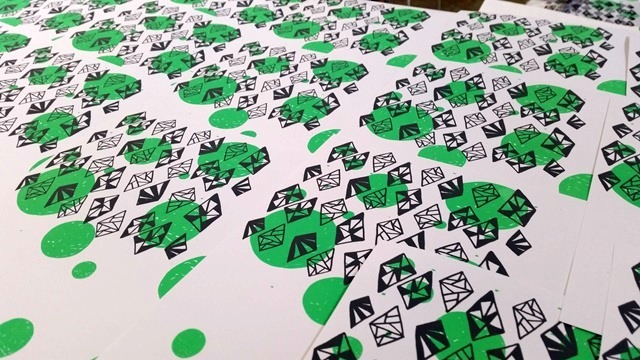 I love screen printing & I did it during my textile design studies. So fun Holly!